Lyman Allyn Art Museum was founded in 1926 by Harriet Upson Allyn in memory of her whaling merchant father, Lyman Allyn, as a place for local citizens to learn about art and culture. 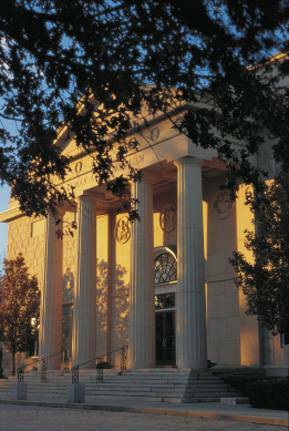 The Museum is housed in a handsome Neo-Classical building designed by Charles A. Platt, architect of The Freer Gallery of Art in Washington DC, the Lyme Art Association Building, and several buildings on the campus of Connecticut College. The Lyman Allyn Art Museum is a Founding Member of the Connecticut Impressionist Art Trail. The permanent collection of over 15,000 pieces encompasses objects from world civilizations covering a time range of 5,000 years. Included are paintings, sculpture, drawings, prints, furniture, decorative arts, and American art from the 18th through 20th centuries. In the Glassenberg Gallery, visitors will have the opportunity to view a new installation of Connecticut Impressionist paintings from the museum's fine permanent collection. Representative works from such renowned Connecticut Impressionist painters as J. Alden Weir, Guy Wiggins and Charles Davis, among others, will be on view. Many of the works recall summer days from the early part of the 20th century as captured by these artists. Lyman Allyn Museum of Art at Connecticut College is a founding member of the Connecticut Impressionist Art Trail. This exhibition, curated by conservator Lance Mayer, features furniture and decorative arts from the Museum's permanent collection. With a focus on Windsor chairmaking in New London, text and visual aids allow viewers to learn about the techniques and decorative tastes that were popular in this area during the 18th century. This exciting exhibit features the fine craftsmanship of Pasquale Montesi, an Italian-born seafarer who immigrated to Norwich, Connecticut in 1898. Working from memory, he created these beautiful folk-models without the aid of blueprints or drawings. For more information, please call 860 443-2545.